NEW YORK TIMES best-selling book! And author of NEW YORK TIMES best seller The Seven Pillars of Health, along with best sellers Toxic Relief, the Bible Cure series, Living in Divine Health, Deadly Emotions, Stress Less, and What Would Jesus Eat? Dr. Don Colbert has sold more than TEN MILLION books. Too many people fight against their own brain and body chemistry when trying to lose weight. This is the reason that up until now, diets have only had a 2% success rate. Tired of saying, "I can't do this!" when looking at diet programs? Then let Dr. Colbert help you take advantage of the latest medical breakthroughs that show you how to work with your body, rather than against it to lose weight easily and keep it off for life. Forget the old diets that work against you. 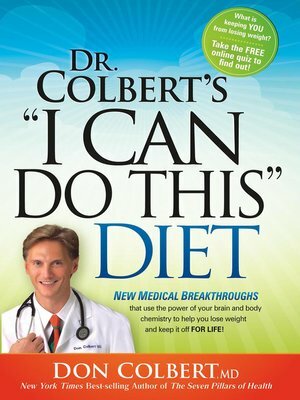 With Dr. Colbert's diet, you can say, "I can do this!"